Ten Years. 10. A decade. TEN YEARS! December 2016 marked the 10th year that we have had the p rivilege to present to you the one and only the National Barbecue News Barbecue Book of the Year Award. My goodness, it seems like it was just yesterday I was praising Ray Lampe for his wonderful book, Dr. BBQ’s Big-Time Barbecue Road Trip, making it the very first honoree of this award. Great books stand the test of time and I’d still today recommend every one of those to be part of every respectable bookshelf of barbecue books. That list is well-represented by some of the biggest names in barbecue, a mix of restauranteurs and competition circuit regulars. To demonstrate just how com- petitive this is every year, we’ve only had one two-time winner – co-authors Ardie Davis and Paul Kirk – although others have come very close. Two publishers have won twice – Andrews McMeel and Ten Speed Press – which is likely indicative of the great barbecue books each one turns out every year. Well, enough with the nostalgia, let’s move on to this year’s nominees. First, let’s review the rules that determine eli- gibility for The National Barbecue News Barbecue Book of the Year Award. To be considered, a book must come from the genre of outdoor cook- ing. Second, a book has to have been printed within the 12 months beginning with the November of the previous year to the November of the current year. This is simply to allow for when this publication goes to press for each December edition in November, but in reality there aren’t many eligible books that are released during those months. Once we’ve arrived at a list of books that meet those qualifications, we whit- tle down the number until we come up with just a handful which we call our finalists. And then, after a good night’s sleep, careful reflection and prayers, one of those books is picked to be the winner. So now, without further ado, here are the books that made finalist this year, or in other words: Put each one of these books in your letter to Santa Claus this year. I know there will be somebody out there who will send me another emailabout my man-crush for Steve Raichlen, but his new book Project Smoke: Seven Steps to Smoked Food Nirvana ($22.95, Workman Publishing, 294 pp.) was easi- ly one of the best books of the year. When you write as many books as Raichlen has it becomes a challenge just to stay fresh and somehow he over- comes that with each new release. Project Smoke is much like his prior books and much different from them as well. If there’s a Mount Rushmore to be sculpted of barbecue book authors, I’m making a strong case for his inclusion (yeah yeah yeah, include that in your email of ridicule as well!). figure to many but I still love every one of his books. And his shows. And his restaurants. And his donkey sauce. I found a reason to review most of his previous books in this space even when he didn’t talk much about barbecue, so it was a relief to me when he made it easy this time with Guy on Fire: 130 Recipes for Adventures in Outdoor Cooking ($14.99, William Morrow Cookbooks, 352 pp.). It’s pages full of his useful flair, edgy recipes and, of course, wild hairdo and tats. Pure Fieri. You know I always wax poetic when I find books that tell the great stories of barbecue, as I did when I reviewed The One True Barbecue: Fire, Smoke, and the Pitmasters Who Cook the Whole Hog by Rien Fertel ($25, Touchstone, 274 pp.). I don’t mind when they skip on the recipes when you have a talented author like Fertel telling a wonderful and wondrous story like this one. America’s Test Kitchen TV show and Cooks Illustrated magazine have always been favorites of those on the competition circuit so I knew right away that Master of the Grill: Foolproof Recipes, Top-Rated Gadgets, Gear & Ingredients Plus Clever Test Kitchen Tips & Fascinating Food Science by America’s Test Kitchen ($29.95, America’s Test Kitchen, 454 pp.) would be very positively received. It is an impeccably well- done book, as it is with everything from ATK. A great friend to all of us, the only surprise from Dr. BBQ in the book he released this month is that he authored it under his actual name. 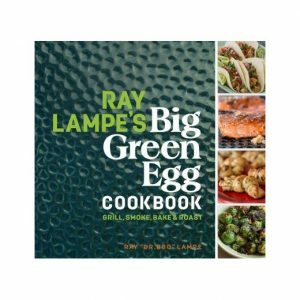 Ray Lampe’s Big Green Egg Cookbook ($25, Andrews McMeel Publishing, 160 pp.) is an excellent book that is nearly as entertaining as it was on the message boards back when he was trolling the BGE crowd. 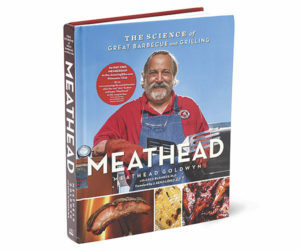 I absolutely loved Meathead Goldwyn’s new book, Meathead: The Science of Great Barbecue and Grilling ($35, Houghton Mifflin Harcourt, 512 pp.). I loved his brash style, his willingness to be boastful while at the same time having the know-how to back up his claims, even ones that were long-held as gospel. Goldwyn wrote an outstand- ing book, really one of the best I’ve ever had the privilege to enjoy. It was so doggone good that it finished as the runner-up to this year’s winner. 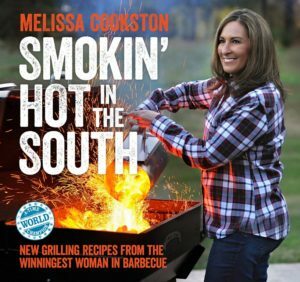 Smokin’ Hot in the South: New Grilling Recipes from the Winningest Woman in Barbecue by Melissa Cookston ($22.99, Andrews McMeel Publishing, 192 pp.) 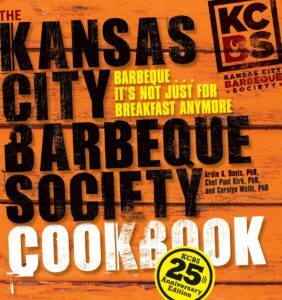 is the year’s the National Barbecue News Barbecue Book of the Year Award winner. In a year of great books, this one was the great- est. That is likely no surprise to any- one who knows Cookston because she holds herself to an incredibly high standard. In this instance, her first book was super and finished as a finalist for this award. This year she came back with an even better book and clearly earned this honor. So congratulations to Melissa Cookston as this year’s honoree and to Andrews McMeel for becoming our first three-time winning publisher. So with the minutes past deadline clicking away, it is time to say thank you once again for permitting me the privilege to tell you about these books each month. Special thanks to my wonderful editor, Kell, and of course the lovely Melissa Lott. Enjoy the upcoming holidays, watch some football (Boca Raton Bowl, Tuesday, December 20, 7 p.m. ET on ESPN), ring in the New Year and come back here in January for many more great books on barbecue.